I return to my Tuesdays with Thessalonians today by looking at 2 Thessalonians 1:5-6b where Paul tries to encourage a group of people who have had a rather rough time. 5 All this is evidence that God’s judgment is right, and as a result you will be counted worthy of the kingdom of God, for which you are suffering. 6 God is just: He will pay back trouble to those who trouble you 7 and give relief to you who are troubled, and to us as well. The Thessalonians are continuing to be persecuted and they are beginning to wonder: Why are we suffering, where is God, and why doesn't God help us? The church in which Paul expressed so much confidence in his first letter is now struggling and he moves swiftly to explain to them that suffering is not evidence that God has abandon them, but rather demonstrates that when God does act his judgment and the punishment he delivers will be right. I have lived in three different countries in my life and never experienced persecution because of my faith. Everywhere I have lived Christianity was either a majority religion or an accepted expression of religious faith. I have never lost a job, been forced to leave my family or arrested because of my belief in Jesus as Lord. For most Christians, especially those living in the western world, this is a common experience. To be sure, there are some who encounter resistance because of their faith and some have experienced animosity towards them and, in even more rare cases, have been physically abused for their faith. But the vast majority of Christians living in the so-called “first world” has and probably never will experience persecution for their faith. The same cannot be said for the Christian brothers and sisters living in places where Christianity is a minority religion and its adherent are reviled by those who live around them. My wife and I have the pleasure of knowing a couple from India who work in a Bible school training Indian pastors. Their experiences are very different from that of western Christians. Indian pastors, especially those living in the countryside, minister in a country where Christianity is a minority religion. 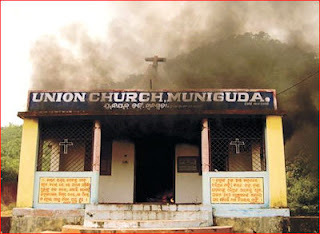 They face almost constant opposition from their Hindu neighbors and the nation’s laws often work against Christians. It’s not uncommon for pastors to be physically attacked, arrested without charge and have their churches either shut down or burned down. Although India’s constitution allows for freedom of religion, anti-conversion laws have been introduced. These laws were passed to stop forced conversions of Hindus, but have been used to prevent any conversions. As a result, many pastors can no longer baptize new Christians publicly and instead are forced to use hidden wells in the middle of the night. In some cases it has been difficult for Christians to bury their dead since some local governments will not allow Christian internment in or near the village. For these modern day Christians, the persecution of the church is not something they read about in the Bible, church history books and missionary letters; they live it every day. It’s not easy to know how to respond to the type of persecution our friends experience in India. Not even Paul offers the Thessalonians advice on how to respond to those who are persecuting them. But the teachings of Jesus and Paul elsewhere in the New Testament suggest that the response of the Christian is very different from that of the persecutor. In the Sermon on the Mount Jesus says “Love your enemies and pray for those who persecute you that you may be children of your father in heaven” (Matt 5:44). Can Jesus be serious? It is one thing to pray for someone that is persecuting me, but to love them would mean I need to come in contact with them to express that love. But the attitude of love is what is crucial to the identity of being a follower of Jesus. And Jesus stresses that this kind of love has a purpose “that you may be children of your father in heaven.” To be a part of God’s kingdom means reflecting the character of the father. Since, as Jesus points out, God gives sunshine and rain to both the righteous and the unrighteous, Christians too should treat their enemies with love as God does. Although Paul offers no advice on how to deal with persecution here he does in Romans 12:14 where he says “Bless those who persecute you, bless and not curse.” Similarly, in 1 Cor 4:12 Paul reports that “When we are cursed, we bless; when we are persecuted, we endure it; when we are slandered, we answer kindly.” While not using exactly the same words as Jesus, Paul seems to be echoing them. There is something striking about both the words of Jesus and Paul here. Neither of them is suggesting a passive response to the persecutors. The acts of praying, loving and blessing someone all require that the persecuted proactively step out and engage their enemies in a way that is the complete opposite of the treatment they are receiving. This means that for the Christian our response is not simply one of non-retaliation. It is not only turning the other cheek and forgoing vengeance. Instead there is a determined response to love those who are hurting us, to pray for them and wish them all of the blessings of life. Neither Jesus nor Paul is says this is easy, but it is the response that we are called to give. At the same time the Christian response to persecution can be a witness to God. Indeed, Paul went around boasting to other churches about the endurance of the Thessalonians. Those who are persecuted for their faith have often become a testimony to God. In the NT we see the apostles rejoice when they are persecuted (Acts 5:41) and 1 Peter suggests that we should not be ashamed when we suffer (1 Pet 4:12-19). Paul too says we should rejoice because compared with our future glory our present sufferings mean little (Rom 5:3-5; 8:17). Church history records many who gave their lives as a testimony to God. People like Polycarp, Tyndale and Bonheoffer are an enduring witness to God. When people like my friends in India endure persecution and suffering it is testimony that God is at work in them and will one day set the world aright. But there is another side to this coin. While it is true that suffering is sometimes interpreted as the believer “doing something right,” we might not want to always gauge our relationship with God by our hardships. Paul was writing to a group of people in a particular location, at a particular time in a particular set of circumstances. It’s not that we can’t learn from the Thessalonian experience of suffering, but we don’t want to assume that it is the only paradigm for evaluating our standing with God. The important thing to keep in mind here is that Paul is trying to give hope and perspective to a group of people who are suffering. Paul’s promise that God will one day punish those who are causing pain can be a comfort. Such promises confirm that justice is important to God even if God doesn't do it the way or in the time we would prefer. I remember the bumper sticker many years ago that declared "Jesus is my Copilot." I suppose that it was meant to comfort and reassure me that even though the guy in front of me might have horrible driving skills, Jesus was sitting in the seat next to him ready to take the wheel and protect us all. While I am a bit cynical about that bumper sticker there may be something to it. After all, I can't remember ever seeing an accident with a car bearing said bumper sticker. Now it seems that Jesus has moved into cyberspace. A recent study reveals that "Jesus" has become a favorite password for some. SplashID Safe compiled the list of the years most popular passwords. The top three passwords, "password," "123456” and "12345678," remain unchanged from last year's list. New entries to this year's list include "welcome," "jesus," "ninja," "mustang" and "password1." Of course using Jesus as a password opens one up to all sorts of theological conundrums. What happens if your Jesus protected account is hacked? Is Jesus negligent? Have the powers of darkness become more powerful? And what happens if you get a computer virus? Do you ask Jesus to heal your computer or do you assume that you simply lacked enough faith? And in the realm of theodicy, if your hard drive crashes while using Jesus as a password is Jesus somehow to blame?